Syndicate, the hyper-violent mid-90s Bullfrog classic, is coming to GOG on Thursday. You probably know by now that Syndicate is being "reimagined" as a first-person shooter by Starbreeze, the studio that gave us the Riddick games. You may not know, however, why Syndicate was chosen for the overhaul, or why so many decrepit old-timers are so worked up about it. Here's your chance to find out. The original Syndicate, in which people are kidnapped, rebuilt as cyborgs, pumped full of drugs, armed to the teeth and then turned loose on territories held by rival corporations, is coming to Good Old Games - GOG, if you prefer - on Thursday, January 19. As always, the game will be updated to run on modern hardware, and will be available for the stupidly low price of $5.99. And in case that's not cheap enough, ten copies are being given away to the best ideas for four-man cyborg squads submitted to the GOG forums. 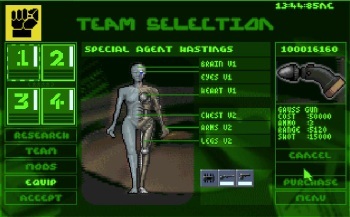 Syndicate was a groundbreaking game and it's pretty seriously retro, too, so it naturally suffers from a number of "quirks" in gameplay. It's also awesome as hell, and for six bucks? You just can't go wrong at that price. Full details about the upcoming Syndicate release and giveaway are available at GOG.com.